If you love music, here is some great news for you. 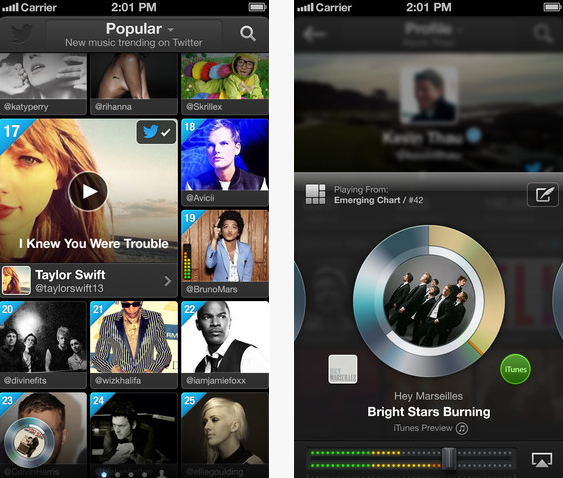 Twitter has launched the Twitter #music, a new service to help you discover music based on Twitter. Twitter #music will be using the Twitter activity including Tweets, follows & engagement to provide most popular tracks and emerging artists. At the moment, the app uses just three services i.e. iTunes, Spotify or Rdio to provide you music previews & not the full tracks while exploring music in the app. If you want to access the full tracks of the music, you must login to the iTunes, Spotify or Rdio account. You can download Twitter #music from the Apple iOS App Store here. It is also available on the web at music.twitter.com. The app is still not available on Android Platform and hopefully will arrive sometime soon. At the moment, it is only available in the US, Canada, the UK, Ireland, Australia and New Zealand. People in other parts of the world need to wait sometime for the roll out to reach them.